On Sunday, September 13, 2015, actress and wedding guest Lindsay Lohan published a 248-word essay on Instagram about the events of Tuesday, September 11, 2001. Because many people share stories about how the events of 9/11 affected them, that Lohan shared hers isn’t surprising. What’s notable is that the story is a messy, incomprehensible cloud of disconnected thoughts that may not even be about 9/11 at all???? It appears to have been written quickly, in one breathless and speedy mashing of thumbs. 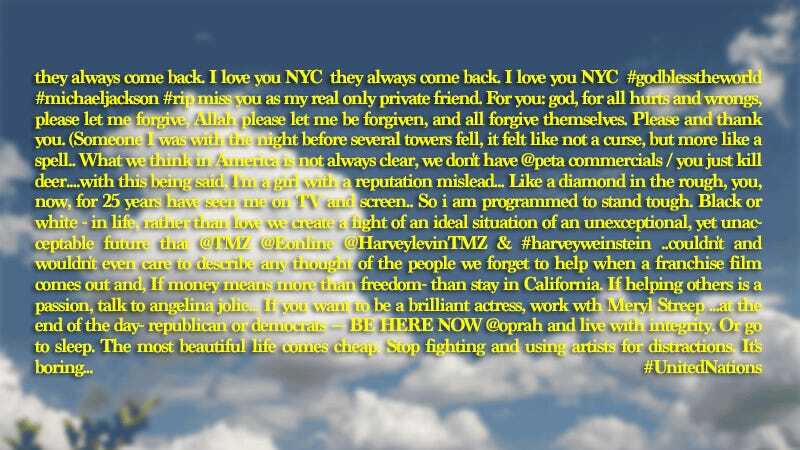 She moves from topic to topic - from forgiveness, to freedom, to PETA, and all the way to TMZ. Autocorrect either fails to engage or corrects incorrectly — is this poetry? A parenthetical begins, but never ends — are we the closing parenthesis? While reading it, you can almost picture Lohan skillfully smoking a cigarette with no hands as the ash grows and grows to over an inch long — somehow failing to drop on her phone. That applies here, too. What do you think it means?